Wahoo! 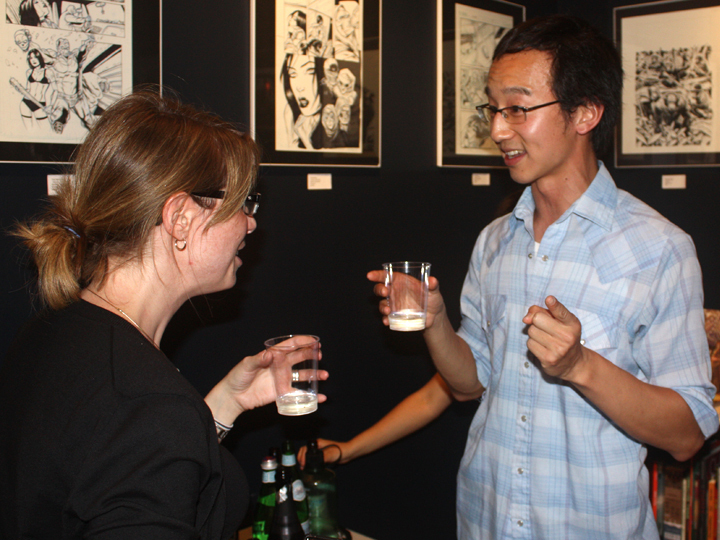 Last Saturday was a good time as Bergen Street Comics hosted the Johnny Hiro Brooklyn Release Party. I’d wanted to plan a release party, but my head had been frazzled as of late. At some point, Tom and Amy Adams offered to host the release, and it seemed like a good idea, just to take the responsibility off of me. I was still feeling a bit out of sorts that day. But decided to treat myself to a sushi dinner, which made me feel much better. After dinner, I went into Bergen Street Comics and I instantly felt better. There was hip-hop, balloons, and plenty of sake and Hitachino white ale (my favorite Japanese beer). And soon enough, some very good people had showed up, good friends I hadn’t seen in a while. I got to talk a while to John Davis at Bookazine, which was really nice. 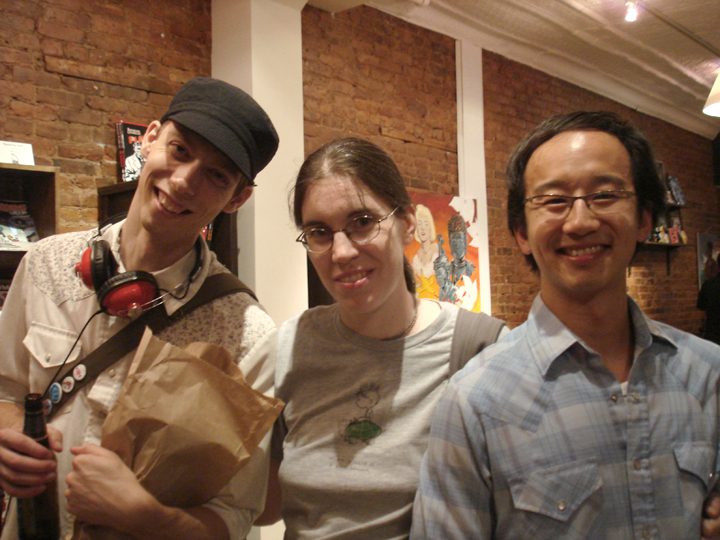 He introduced me to Stephanie from the Word bookstore in Williamsburg. Gina Gagliano from First Second Books dropped by. Thomas Turnbull, Jesse Post (my editor), and my good friend Opus came. There were a good amount of cartoonists there such as Neil Swaab who does the horrendously wonderful Rehabilitating Mr. Wiggles. Phil from the IndieSpinnerRack podcast. 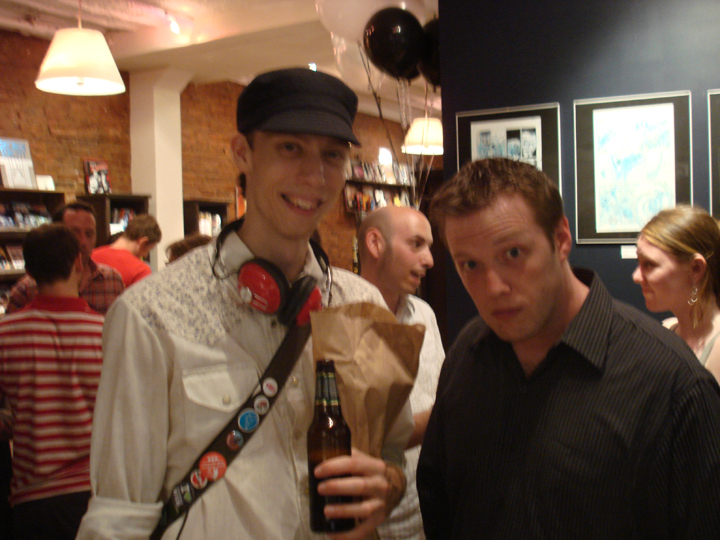 Dean Haspiel was there, though unfortunately I didn’t get a chance to talk to him. Grr, next time. One of my bosses and Mammel Magazine contributor Tom Forget stayed for a good deal of the party. 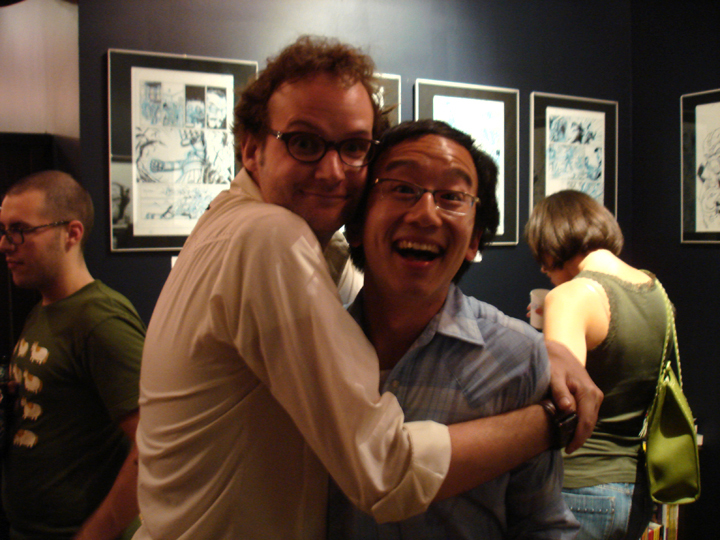 And GB Tran who is probably working on what will become my new favorite comic. Amy Adams and I shared a shot of sake–she told me later that that was the point in which she started getting really drunk, I’m happy I got to be the enabler. Afterwards, we went to a little dive bar across the street and hung out there for an hour or so. At the end of the night, I drunkenly walked home and fell asleep instantly. I met up with Jesse in the morning for breakfast, we did a drink tally. It turns out I drank 10 alcoholic beverages that night, Jesse had 12. It’s rare that I drink this much, but hey, how often to I come out with a book? Anyway, thanks to all that came out and celebrated. I had a great time, and yes, my head is feeling a little less frazzled these days (albeit a bit more throbbish now). And a huge thanks to Tom and Amy Adams.